There are several design ideas that can be incorporated into an indoor swimming pool that not only add beauty, but safety and function as well. Here are some of the options to consider when you begin the design process. Choose nonslip flooring for the floor surrounding the pool. Not only will this provide additional safety, but it will add to the longevity of the space. There are several beautiful styles and colors that will add enhance this special area of your home and make swimmers more comfortable as they enter and leave the pool’s water. Make sure the design professional creates an indoor swimming pool space that complements the rest of the home. As a homeowner, you will not want this space to seem disjointed from the rest of your beautiful home design, so be sure to select a designer who understands that an aesthetically pleasing structure is of utmost importance. Consider adding folding doors, a retractable roof and other features that can make your indoor pool seems more connected to the outdoor surroundings. Allowing an indoor pool to mesh with its outdoor surrounding will make this type of pool pleasing when the weather is warmer. Sliding or folding doors or a retractable roof also add pleasant natural lighting to the space. And, who doesn’t like a little extra sunshine? Be sure to include easy-to-reach and safe ladders, steps and step-downs in your pool that include proper lighting. 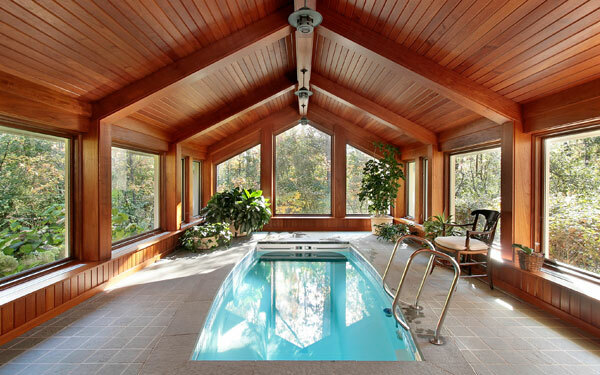 Because many homeowners who build indoor pools may be using this primarily for health reasons, it is extremely important to make use of the pool easy and safe for people of all ages. When the design process begins, do not neglect the area surrounding the pool. Of course, the actual pool is the main focal point, but make the space surrounding inviting with comfortable seating, possibly a place for dining and maybe even a waterfall or built-in fireplace. Adding extra amenities will make this a space that extends the living area of your home. Remember to make the pool's structure an extension of the rest of your home. Don’t compromise of lesser quality materials for this space. Incorporating the overall style of the home’s interior into this indoor/outdoor style space will create a more beautiful end result. Find ways to add interest to the pool if being used for recreational purposes. Can the pool wrap around the side of the interior spaces? Can large windows in some rooms overlook the pool area creating interesting views from other parts of the home? You can truly create a unique and custom feel to your indoor swimming pool by getting the design professional to review the style and feel of your home. Sticking with a basic rectangular shape may appear boring and uninspired. Once you have decided to add an exciting feature like an indoor swimming pool to your home design, don’t forget the design aspect of this space. Besides being a playful and fun space for year-round enjoyment, an indoor swimming pool offers an amazing opportunity for custom design ideas and expanding your own personality into this special area of your home.